Deb's Cup of Tea: I'm Not Afraid -- What Am I Doing Up Here!? Disneyland. It bills itself as "the happiest place on earth". If I'm going to go to a convention located just down the street from this place, I have to go there, right? If you aren't familiar with Disneyland, it's really two parks; the land itself, and California Adventure, across the plaza. The premise of California Adventure is a recreation of California, Disney-fied, of course, as it was when Walt showed up in the 1920's. 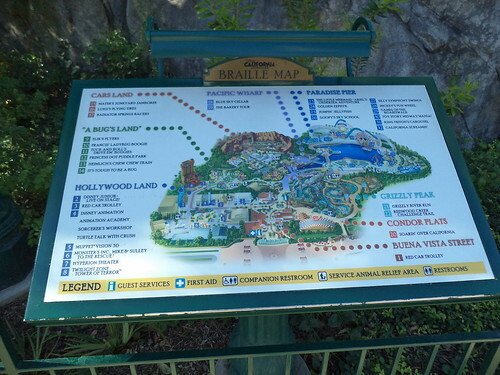 There are, of course, additions to the land which wouldn't, really, be what Walt saw, like Cars Land, from the Pixar movies. But the Main Street buildings bear a resemblance to what one would have seen in Anaheim in the 1920's. One of the land's big attractions is the pier area, a Boardwalk-ish section with arcade games, similar to a 1920's-era amusement park. 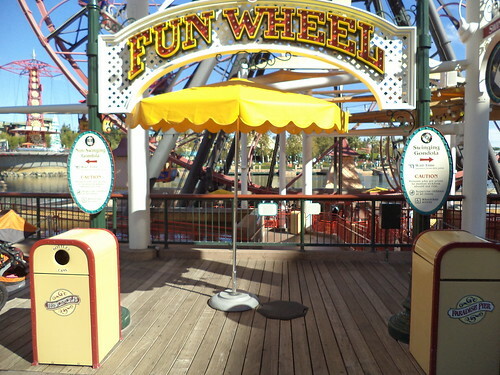 It is dominated by a roller coaster and a ferris wheel. 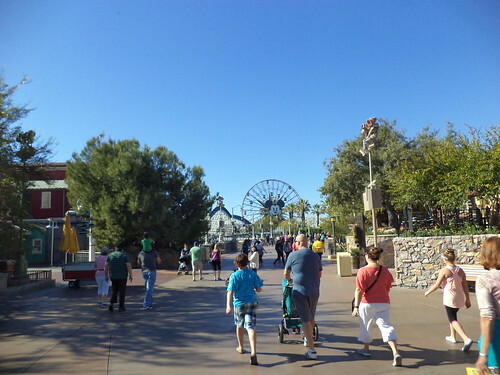 You can see both as we walk towards them from the Main Street area towards the pier. Now, if you know me at all, you know roller coasters are not my thing. There is an exception for Big Thunder Mountain Railway and I really wanted to try the Matterhorn. Supposedly, Space Mountain was based off that and I don't mind Space Mountain; I think, mainly because it's done in the dark. The physics behind roller coasters are clear. They take you up high and drop you in creative ways. Being afraid of heights, the "high" part of that is troubling and, well, the "dropping creatively" can get rather hairy. 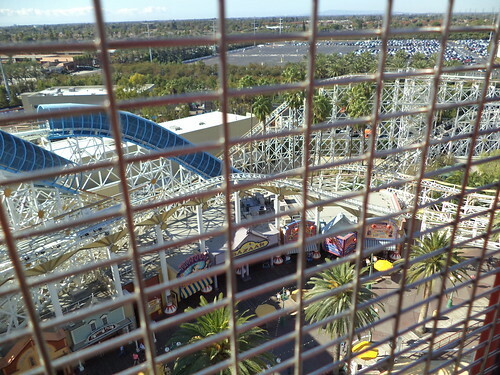 As we got closer to the pier area, I got a full view of the coaster. Wow and um, no, thanks. I'll just sit right over here. 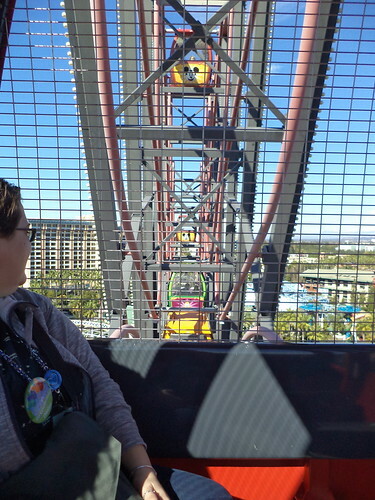 Fortunately, Liz was all about shepherding me about the parks to have the best time possible so she really didn't care if I didn't want to go on the coaster. She was staying an extra day beyond me and she has a yearly pass so she can ride this whenever she wants. I debated. Many years ago, Carole and I went to Navy Pier and rode the ferris wheel there. It's a reasonably enclosed structure of strong metal. I can do this. I got three quarters of the way up and was terrified, so scared I had to close my eyes. It didn't bother Carole at all. I couldn't open my eyes again until we were half-way down. I couldn't get off the thing fast enough. In my head, the Navy Pier ferris wheel looked much bigger than this one. The views from up there must be fantastic. I love to fly and enjoy looking out the windows at the 25-30,000 feet between me and the ground. It's been years since I was on one of these. Disney wouldn't put any guest in a suspect ride. I was totally safe. How bad could this be? There are two lines here. If you go to the left, you ride in the usual gondola. 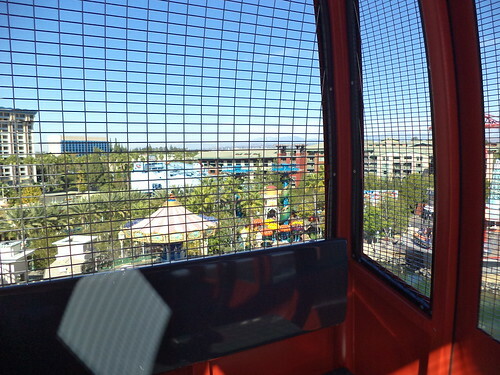 If you go to the right, you can ride in a swinging gondola. We watched those. 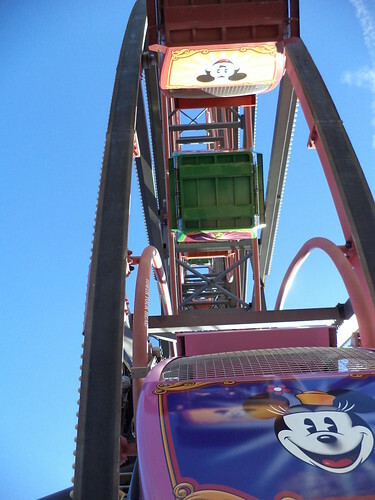 They travel along a track and swing out from the wheel, swaying back and forth. Oh lawd 'o mercy! Not for a million dollars. We will take the standard gondola, please and thank you. These don't rock. The car glides to a stop and we get in. The wheel starts and up we go. Suddenly, about a quarter of the way up, my brain, which has largely been in "ohboy ohboy ohboy!" mode, kicks in and says, "What do you think you are doing in this contraption? YOU HATE HEIGHTS!" 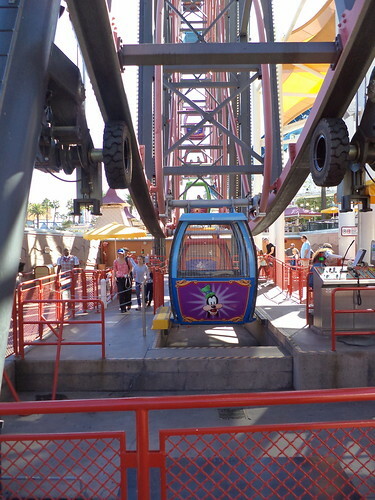 There is a realization that I am on this ride and getting out is not an option, at least not without extreme humiliation and having to ride all the way around anyway before they can stop the thing and let me off. That familiar twinge of fear I know so well starts to develop in my stomach. Doggoneit. There is no reason to be afraid and yet, terror is growing. About that time, we clear the height of the trees and I can look out. To the left is the Grand Californian Hotel. 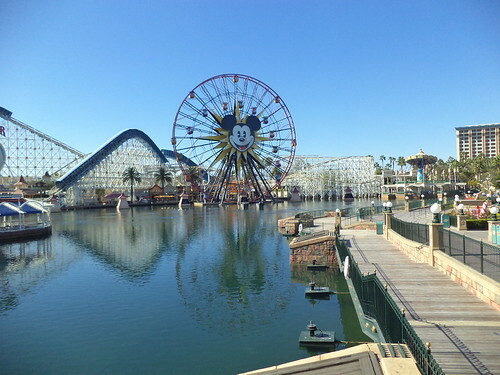 Paradise Pier Hotel is in the center with the Disneyland Hotel to the right. Far off in the distance are mountains. I ask Liz to tell me about this park and the hotels. An admitted "Disney freak", she told me all sorts of tidbits about the hotels and the park. Her excitement was infectious and I felt the terror ease. It never really left, but I was determined to keep it at bay. A camera with which to document my travels is my best friend at a time like this. I can point it at the view and look at the viewfinder. Looking down is not so scary when you're looking at the aftermath of pushing the shutter. See, there is just no way I'd be able to ride that coaster unless I was duct taped into the seat and had duct tape over my eyes. We climbed over the top and headed back down. This really doesn't give you a feel for the swinging of some of the cars. I think it's the green-bottomed one that is moving around on the extra set of tracks, but I'm not sure. We came down and had one more pass around the wheel. I could feel the fear arguing with my sanity over who was going to win. Sanity won out, I'm happy to report. Fear went to the bottom of my stomach and pouted. 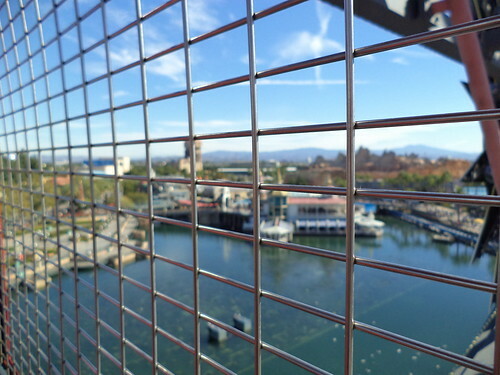 While the cage in this photo is clear, I was aiming for a view of the mountains in the east. Forgot about that focus business. I had Liz take my photo as documentation of my journey around the ferris wheel. I know I don't look the happiest for being in "the happiest place on earth". But, I wasn't clutching the seat or the car sides in abject terror and my eyes are open. This is a win. Going up has never been a problem, other than the small rungs and climbing being a bit of a problem for my legs and my RA. But up I went and did my documentation. Finished, I went to the ladder. The maintenance man went first to hold the ladder and I climbed right down. Didn't give it another thought. It was only as I was in the stairwell walking down the stairs to go outside, that I realized what had just happened. There is probably not a chance that I will "outgrow" my fear of heights to the point that roller coasters don't scare the bejeezus out of me. But something has changed. Something, confidence in me, perhaps, has grown so the fear I have long lived with doesn't have to be accommodated to the exclusion of fun. 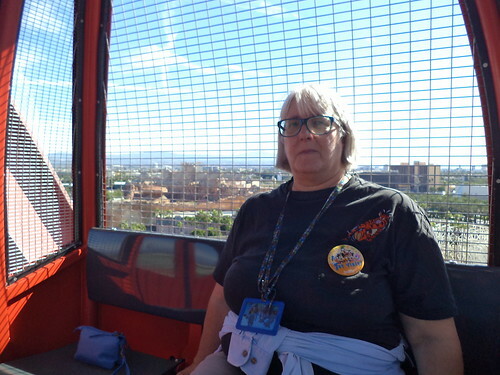 I was nervous, to be sure, and I recognized that if I didn't come to grips with my fear: win over it, if you will; that this trip would be remembered for my breaking down and screaming to get off the ferris wheel. I couldn't have that. Would I ride this again? In a heartbeat. The view is wonderful. I'd actually like to ride it at night. I'll bet it's doubly gorgeous then.